The ultimate Vancouver townhomes are now selling with new listings at 2543, 2545 and 2547 West 1st Avenue in central Vancouver real estate market. Three exquisitely crafted Avalon House townhomes located in the heart of Kitsilano reale state market offering panoramic views of Vancouver Island to downtown Vancouver. The pre-sale Vancouver Avalon House townhomes in Kits community are finished throughout to the highest standards that will satisfy the most discriminating home buyer. Each Avalon Townhomes in Kitsilano Vancouver real estate has a large landscaped garden and a concrete two car garage. The Townhome Avalon House Vancouver home sizes range from two thousand one hundred and twenty six sq ft to twenty four hundred and sixty five sq ft. The offering for these pre-sale Kits Townhomes at Avalon House in Vancouver property market are between $2.25 M to $2.65 M. Please call Alan at 604.266.1364 for additional details. Where can you buy an exquisite 2296 square foot Vancouver townhome for sale with an uninterrupted view from Vancouver Island to Downtown, a large landscaped garden, a unique garage top deck, a two car concrete garage, a large gourmet Gaggenau equipped kitchen, three bedrooms, a den, three and a half bathrooms, a fully equipped media room with wet bar and so much more for an asking price of only $2,080,000 here at the Avalon House Vancouver townhomes for sale? Simply put, the new Vancouver Avalon House Townhomes represents the best value in new developments. Located at 2545 West 1st Avenue, Vancouver, the Avalon House townhomes are marketed by Alan and you can visit avalonhouse.ca for all the details. Three exquisitely crafted Vancouver townhomes in the heart of Kitsilano real estate market are now available at the Avalon House townhouses. With unique floor plans, inspired landscaping, gas fireplaces and high-end appliances, there is no better offering then the Kits Avalon House Vancouver homes for sale. Superb detailing and custom millwork are just standard features here at this impressive new Avalon House townhomes in Vancouver’s Kitsilano property market. Also, these homes are available December 2008 and ready for move in. Providing inspiring views around all of Vancouver and the North Shore mountains, the Kits townhomes for sale at Avalon House Vancouver are now complete and ready for occupancy. A rare opportunity to own a re-engineered piece of Vancouver history can now be yours at this newly renovated Kits home for sale that offers only three Kitsilano townhomes that are just like nothing you have ever seen before. The real estate development team behind the pre-sale Vancouver Avalon House townhouses include Loy Leyland Architect Inc., Trasolini Chetner Construction Corp, Coldwell Banker Premier Realty, Cristina Oberti Interior Design Inc., the National Home Warranty of Canada and Orca Security Corp. For more information about these Kits houses for sale at the Avalon House Vancouver townhomes, please visit Coldwell Banker at 6272 East Boulevard in Vancouver and the contact name is Alan at 604.266.1364. You can also visit www.avalonhouse.ca for more information and to setup a private viewing of these luxury Kitsilano houses for sale at the Avalon House, inspired renovated heritage Vancouver home. 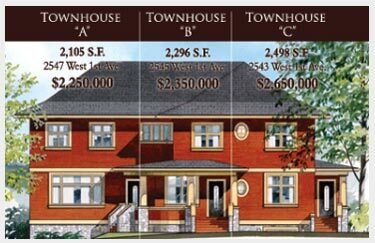 Here is more information regarding the new Avalon House Vancouver townhouses for sale. Townhome A is featured at 2,105 square feet at 2547 West 1st Avenue and is priced at $2,250,000 while Townhouse B is 2,296 sq ft in size at 2545 West 1st Ave in Vancouver BC and is price at $2,350,000. The third Kits Avalon House townhome for sale is ‘C’ which is located at 2543 West 1st Ave Vancouver and is priced at $2,650,000. Some of the incredible features here at the Avalon House Kits houses for sale include pre-wiring and the latest technology including audio visual systems and Touch Screen for automation of lights, heating, audio, security and more. There is also web access for security and satellite interface in addition to lighting systems, ceiling speakers throughout the homes as well as eight TV outlets and nine telephone outlets. The pre-sale Kitsilano Avalon House townhomes also feature Bosch front loading washer and dryer in addition to a central vacuum system, and kitchen kick plate. Also standard at these pre-sale Vancouver Avalon House Kits townhomes for sale include large kitchens with Gaggenau appliances, thirty six inch oven, SubZero wine fridge, microwave, large fridge and stainless steel dishwasher. For coffee lovers, there is also a built in coffee machine. The basement of these pre-sale Kitsilano houses for sale at the Avalon House heritage homes include a laundry, powder room, full bathroom, bedroom/hobby space, gas fireplace, wet bar as well as a recreational/theatre room depending on what you’re looking for. The main living floor at the new Avalon House Vancouver townhouses include power rooms, breakfast bars, the kitchen and dining room, a gas fireplace as well as the living room. The second floor features the sleeping bedrooms, gas fireplaces and bathrooms. The pre-sale Kits townhomes at the Avalon House Vancouer also have a studio in the attic as well as a balcony. These unique high-end, four storey strata titled Kitsilano townhomes for sale will not last long! The interior finishing will be of the highest quality throughout with substantial custom millwork. Own a piece of Vancouver heritage, and come see for yourself. The pre-sale Vancouver Avalon House Kitsilano homes for sale are now previewing. 3 Brand New Town Homes in the Heart of Kitsilano For Sale! 2463, 2465 and 2467 West 8th Avenue Vancouver Kits townhomes for sale is now open Sunday two to four. These special Kitsilano townhomes for sale present two bedroom plus den and 2.5 bathroom plus recreational room and a bonus 950 sq ft private fenced yard, deck and patio. These pre-construction Kitsilano West 8th Avenue Vancouver townhouses for sale will also feature secured underground parking and storage, gorgeous kitchen with built ins and wainscoting in addition to nine foot vaulted ceilings and exceptional quality workmanship and materials throughout. The pre-sale Kits townhomes for sale at Avalon House West 8th Ave will feature solid hardwood flooring, wool carpeting, radiant heating and interiors by Kelly Deck Design. The floor plans for these new Kitsilano townhouses for sale will range from 1217 to 1485 square feet in size, so don’t miss out! The price before GST is from $960,000 to $998,000. Call Peter at Sutton Group West Coast Realty for more information about these luxury Kitsilano townhomes for sale. Avalon House – The Ultimate Kitslano Townhomes for sale at 2543, 2545 and 2547 West 1st Avenue are also being sold right now bay Alan at 604.266.1364. Three exquisitely crafted Kitsilano townhomes for sale located in the heart of Vancouver’s Kits real estate district offering panoramic views from Vancouver Island to the downtown city skyline. Finished throughout to the highest standards, that will satisfy the more discerning of home buyers, these Kitsilano townhomes for sale at the Avalon House Vancouver will have a large landscaped garden and a concrete two car garage. The Avalon House Kits townhouses will range between 2126 sq ft to 2465 square feet and they are being offered between $2.25M to $2.65M. Right now, you can purchase a luxury South Granville Vancouver townhome for sale at the French Inspired Fontainebleau Townhouses. These ‘tres chic’ three new opportunities for Vancouver home buyers at the South Granville Fontainebleau townhomes for sale are French inspired with a great hospital address. The Vancouver Fontainebleau Townhomes represent the best South Granville real estate value! Three quality built Vancouver West Side townhomes close to South Granville shopping district are now being offered through Dexter Associates Realty. Each Fontainebleau Vancouver townhome for sale has its own front door, huge lovely living room, separate dining room with lots of space to fit house sized furniture. In addition, these new South Granville Fontainebleau Vancouver west side townhomes for sale will feature a gourmet kitchen with hardwood flooring and a private patio on the main. The two bedrooms and full bathroom on the upper floor and a great master bedroom and luxury ensuite bathroom will round out the top floor of these impressive luxury Vancouver townhomes at the Fontainebleau South Granville. Two parking spaces are also included with your purchase. The West Side Vancouver townhomes for sale at the French inspired Fontainebleau Townhouses range from 1533 to 1595 square feet in size with the finest quality built by Nexus Developers. A little bit of Paris close to VGH, Granville Market and much more. The location of the French inspired Westside Vancouver Fontainebleau Townhomes in South Granville real estate district are on Birch Street. 3023 Birch Street Fontainebleau townhome is being offered at $985,000, 3025 Birch St Vancouver is offered at $998,000 and the final South Granville Fontainebleau Vancouver Westside townhome is on the market at $1,049,000. Located in the Lower Shaughnessy real estate market of Vancouver’s West Side, you can now own property in ths prestigious neighbourhood for a fraction of the price at these new Shaughnessy Townhomes for sale. Located on 13th Avenue in Kits real estate district, these one and three bedroom townhouses for sale range between six hundred and ninety eight thousand to $1.278 M. All of the luxury hojmes are designed by Alexandre Ravkov Inc, a prestigious European builder. The style of the Kitsilano townhomes for sale in the Lower Shaughnessy Vancouver Westside real estate market are craftsman style and all pre-sale homes will include an open gourmet kitchen, hardwood flooring and stainless steel appliances by Maytag and Fisher & Paykel. In addition, these pre-sale Vancouver Kits townhomes in Lower Shaughnessy will present gourmet kitchens, large yards for outdoor living space as well as in suite laundry and security system. The lot size of this Lower Shaughnessy Vancouver is approximately 6250 square feet and it is considered a new development. Here are the details about the four units for sale: The Shaughnessy Townhomes features 1877 West 13th Avenue garden unit that is a one bedroom plus den and 1.5 full bathrooms with about 866 square feet of living space priced at $698,000. The second unit here at the Vancouver Kitsilano townhomes is 1875 West 13th Avenue which is priced at $948k and is a west unit with 3 bedrooms, 2.5 full bathrooms and 1229 sqft. The 1871 West 13th Avenue Vancouver townhome for sale will be $1.039M and is the east unit with 3 beds and 2 baths for about 1388 square feet of living space. Lastly, the Lower Shaughnessy townhomes at 1881 West 13th Ave is $1.278M and is the rear home with 3 beds and 3 full bathrooms totaling 1710 square feet in size. IF you would like more information about these Lower Shaughnessy/Kits Vancouver townhouses for sale, please contact Philip at 604.649.0228 of RE/MAX Select Properties.